When I was a kid, our emergency radio was an AM radio that my mom kept in the basement along with some spare batteries. This radio was supposed to be our lifeline to the outside world should a major disaster strike. Luckily, we never had to use that emergency radio in a true disaster situation. Standard AM/FM radios are not meant to be used in an emergency. They simply don’t have enough range or the right features. 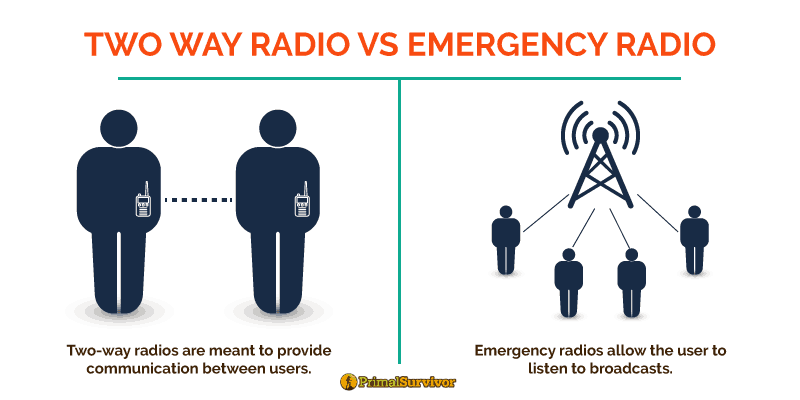 So, what emergency radio should you be using? Making sense of all these emergency radio features can be incredibly confusing. To make it easier, here is my completely unbiased guide to the best emergency radios for your money. Simply speaking, an emergency radio is a radio which allows you to get information during a disaster. They are often also called NOAA radios, crank radios, or survival radios. A basic AM/FM radio (like the one my mom used) can function in an emergency. 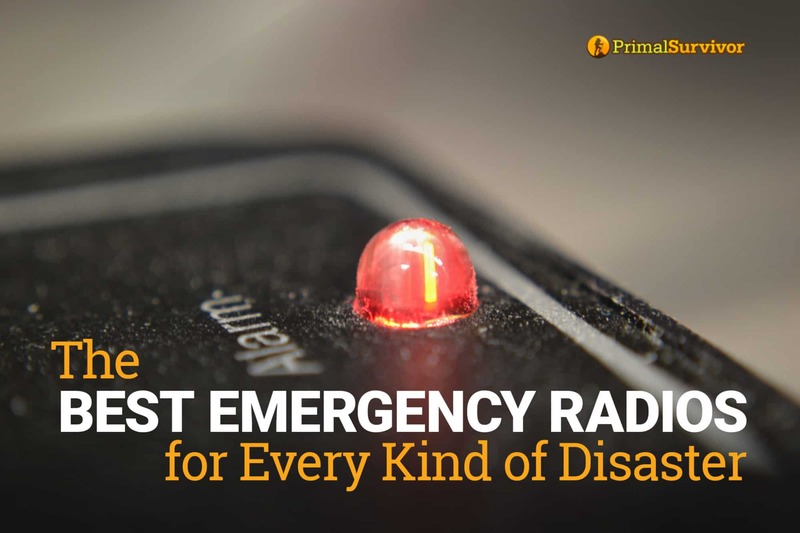 However, a true emergency radio will have features – like NOAA alerts, long range, and alternative power sources – which make it more suitable for emergency situations. Emergency radios are different than two-way radios, such as ham radios. Two-way radios are meant to provide communication between users. Emergency radios allow the user to listen to broadcasts. Note that many good two-way radios can also pick up NOAA weather stations and be used as emergency radios. 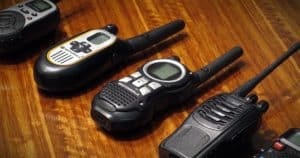 If you are interested in this type of radio, I suggest you read our post about the best two-way radios. It covers the various types, such as GMRS, CB, MURS, FRS, and ham. Even if you get a two-way radio, I would still suggest getting a standard emergency radio. Often, emergency radios have longer ranges, better battery life, and features that you simply can’t pack into a portable two-way radio. Today’s emergency radios come with all sorts of high-tech features. A lot of these, such as flashlights and sirens, are really nice to have. NOAA stands for “National Oceanic and Atmospheric Administration.” It is part of the National Weather Service (NWS). NOAA issues warnings to the public about emergencies. The NOAA broadcasts on seven different VHF frequencies. Not all standard AM/FM radios pick up NOAA frequencies! 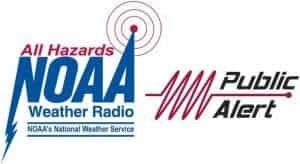 To find out the broadcasting frequency of your local area (in the USA or Canada), see the NOAA station listings webpage. Only buy an emergency radio with the NOAA label! Alternatively, you can look for an emergency radio with the “Public Alert” label. These radios also get NOAA frequencies. Some even carry both labels. For emergencies like hurricanes, we usually get warned on the news days (if not weeks) before the disaster hits. But what about emergencies that come without warning? This is where the “alarm tone” feature of emergency radios comes in. The alarm tone feature of emergency radio allows you to keep your emergency radio turned on 24/7 but in silent mode. If a major emergency occurs, the NWS will send out alerts using a special tone. This special tone will activate your emergency radio and cause it to turn on. There are also emergency radios which have alarm features for disabled people. Instead of a sound alarm, they might vibrate or use a visual signal like a flashing light. Note: The NWS does not issue email or SMS alerts. However, many third-party groups do deliver email/SMS alerts. Some are free whereas others require a fee. You can see a list of them here. S.A.M.E. stands for “Specific Area Message Encoding.” This feature lets you custom-program your radio. You get to choose which alerts trigger the alarm to turn on. Imagine that there’s an Amber alert issued at 4am in the next county over. Sure, this is important info to know…but you don’t necessarily want your emergency radio waking you at 4am to tell you! However, if there is a serious chemical spill in your county, you’d want to know this right away so you don’t drink tainted tap water. With the S.A.M.E. feature programmed, you’d be able to only get alerts which are relevant to you. If you plan on keeping your emergency radio on 24/7, then the S.A.M.E. feature is a must-have (in my humble opinion). You’ll have to program the S.A.M.E. codes into your emergency radio. It is pretty easy to do. You can read more about What Is S.A.M.E. here at the NOAA website. Ideally, your emergency radio will have multiple power sources. That way, if one source fails (like your batteries), you will have a backup. I personally prefer a combo of wall charger with USB charging option. Most USB emergency radios also can be used as output to charge other devices. Below is a breakdown of the pros/cons of each charging option. There are a lot of tradeoffs which come with radio size. A small emergency radio is great for situations where you have to flee, such as for keeping in your Bug Out Bag. However, they usually lack features and may only have one power source. Larger units tend to have more features and are built to be more durable, but you won’t be able to carry these with you. My recommendation: Get a larger, more robust emergency radio to keep at home (preferably in your shelter-in-place location). Get a portable two-way radio to keep in your Bug out Bag. Having a waterproof emergency radio is very important, especially if you live in a hurricane or flood zone. Waterproofness is listed as an IP code (which stands for Ingress Protection). Good emergency radios will actually list the IP rating. The first number in an IP code is for how well it protects against solid items, such as dust or even insects. This number should be a 6, which is the maximum protection and means the radio will keep out dust/dirt. The second number indicates how well it holds up against liquids. What IP rating should you get? I would recommend getting an IP rating of at least IP63. Ideally, you’d get a radio with IP67 rating. Unfortunately, most emergency radios don’t test waterproofness so they don’t have an official IP rating. If your home were to get flooded and you accidentally dropped it in the water, it might stop working. 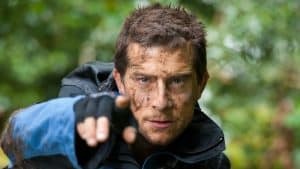 Generally it is the two-way radios which actually have IP ratings (this is because they are often meant to be used outdoors, such as when hunting or camping). Again, this is why it is smart to have both an NOAA emergency radio and a two-way radio which can pick up NOAA broadcasts. Some products come with extra features. 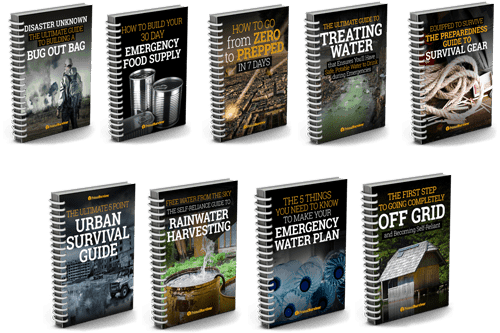 Some might seem excessive or gimmicky, but they could also be very useful in a disaster situation. Here are some that are certainly not essential but are worth considering. Built-in flashlight: If your shelter-in-place location is in a basement, having an extra flashlight in your radio can make a big difference. Do NOT, however, rely on your emergency radio flashlight as your primary flashlight. Power supply outlets: Many models have outlets which let you charge devices like phones and tablets through the emergency radio. Rubber exterior: This will protect the radio if it gets banged or hit by debris. Digital programming: It is easier to use a digital programmer than trying to manually tune into the right stations. Headphone jack: There may be some situations where you want to listen to the radio quietly, such as if your kids are sleeping in the shelter with you. Headphones also use less power than speakers. 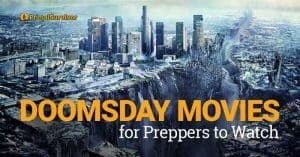 I’ve selected a few great NOAA emergency radios and listed them below. But please bear in mind that you will probably want a two-way radio in addition to the emergency radio you keep at home. For example, you might keep your larger, more advanced emergency radio at home. 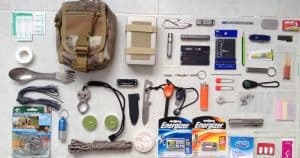 A portable two-way radio would go in your Bug Out Bag and/or be kept in your vehicle. Midland is a well-known and respected brand in this space. The WR400 is one of their newer models and it comes with a lot of great features. It is meant to be used as a desktop radio, so don’t plan on packing this in a Bug Out Bag. However, it is really fantastic as a reliable at-home model. You can put it on your bedside table and use it as a standard clock radio (it even has a wake-up alarm). I only wish it was more waterproof and rugged in design. Note that it also don’t have any alternative power sources like a hand crank. So, you’ll need something like a solar charger for charging batteries when they die, or a ton of spare batteries. This has long been one of the most popular products. It has a lot of features to love: it’s compact enough to carry with you, it has a rugged design, it’s NOAA and Public Alert approved, and can be charged multiple ways. The MMR-88 does have an alert feature. Just note that it does not have S.A.M.E. alerts, so you can’t customize the alerts based on your geo location or other preferences. There is a battery which can be charged with solar, hand crank, or USB. You can also use the radio’s USB port as an output to charge other devices. The Kaito KA500 is a mid-priced unit with lots of high-tech features. At first glance, it seems pretty similar to the Kello radio (review below). While neither emergency radio is the all-time best (as you’d expect in this price range), the Kaito is the better of the two. Its design is more thought-out and seems to withstand the test of time. The best thing about the Kaito KA500 is that it has five different charging methods. The hand crank and solar panel actually perform well (better than you’d expect actually). For each 5 minutes, it will give about 2% power to an iPhone 6 battery. Yes, this is slow charging – but I think people have unrealistic expectations about how much energy you can generate from a simple hand crank or tiny solar panel. As for charging the actual radio, it takes about 3 minutes of cranking to give 20 minutes of radio time. This isn’t great, but is a lot better than what most other mid-priced emergency radios offer. The major downside of this emergency radio is that it has an analog tuner. It’s not something you think about until you have to scroll through lots of static to find a usable channel. The signal isn’t the best, so this can be a big annoyance. For its price the Kello is a really great option. Like all of the radios reviewed here, it is NOAA certified. It does have an alert feature but does not have S.A.M.E. alerts (so you can’t customize alerts based on your location). I like that this radio can be charged in multiple ways: AC, DC, built-in solar panel, crank, or batteries. There is a USB port. Just note that you CANNOT charge the radio via USB. Rather, the USB port is for output/charging external devices. If you plug anything into the USB, the radio will automatically turn off and start charging the device. This is another tabletop-type emergency radio. The difference between this one and the Midland WR400 is that the C. Crane model also picks up 2-meter ham radio signals. This means that you won’t be able to communicate via ham (thus don’t require a license), but will hear ham conversations. The 2-meter ham band includes ham radio operators who are on the scene providing emergency assistance. So, you could be able to hear info before it makes it to the general public. The other high-tech feature of the CCRadio 2E Enhanced is that it strengthens weak signals. You’ll get clearer audio from even distant signals. Unfortunately, since it is meant to be used as a desktop radio, you won’t get features like a built-in flashlight or multiple charging methods. It’s also clunky and large, weighing 4lbs. 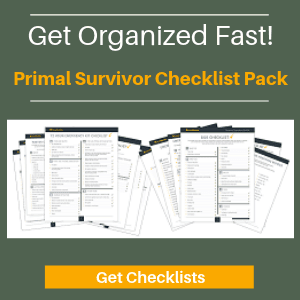 Do you have an emergency radio yet? Which one? Let us know in the comments. Hello, all the listet Radios missing hf SSB ! – A real Radio for emergencies MUST HAVE HF SSB ! I can not believe that radio builders so often “forget” this feature. SSB radios are a bit beyond the scope of this article – we will look at doing an article on this in the future. Thanks for the heads up. You forgot a great two way radio. It covers the most radio frequencies for the least money. And it’s a handheld radio, so it’s very portable. Hi Wallace – seems to be out of stock in most places, is there a newer model?